Richard Turner has added writing to his multitude of talents and a novel to his long list of accomplishments. Buckle up for time travel, karate, and gambling in this action-adventure thriller. Matt McCain, a young man trying to overcome personal loss and family misfortune, and his amigo Juan, a Mexican orphan turned evangelist, are pitted against the Cyphers, a family that utilizes evil for every gain. The presence of Miss Guided, the angel who doesn’t always get it right, changes them all. 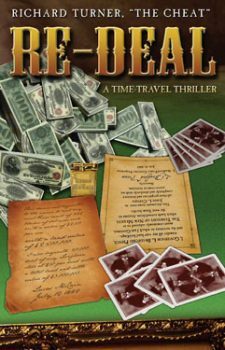 With more twists than a switchback trail, Re-Deal is a time traveling race against evil and misfortune. An 1882 poker showdown promises to change history forever, and Matt McCain aims to be the winner. But first he must match skills with the greatest cheaters of the Old West—from Doc Holliday to S. W. Erdnase. The players, the power, and the present all hinge on the journey back to 1882, a trip through time that Re-Deals history in a startling conclusion. Re-Deal: A Time-Travel Thriller is available as a trade paperback and e-book. You can receive a personally autographed copy of the print edition and take advantage of special pricing for Richard’s fans. Or download the ebook to start reading right away. The Re-Deal e-book comes in a zip file that contains the following formats: PDF (which you can read in Adobe Acrobat Reader on any computer), RTF (which you can read in any word processing program), HTML (which you can read in your browser without being connected to the Internet), EPUB (which you can read in e-book reading devices and on your computer with programs such as Adobe Digital Editions), and TXT (which you can read on your computer or in an e-book reading device). Download and unzip the file and read the format you prefer. 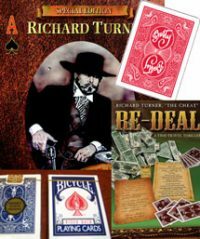 Richard wrote Re-Deal for his fans; card and magic aficionados; lovers of time-travel, action-adventure, and thriller novels; young men; and anyone who enjoys a good tale well-told. For the print book, choose U.S., North America (Canada & Mexico) or International and the appropriate shipping is included.